Flights to Dublin are among those affected. PASSENGERS HAVE BEEN left stranded after the aircraft fuelling system at Stansted Airport was damaged by a lightning strike. Flights have been cancelled, diverted and delayed following the thunderstorm and lightning strikes overnight. 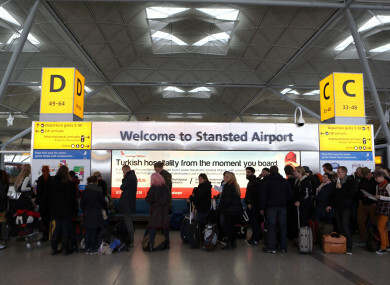 In a statement Stansted Airport said, “Due to an earlier lightning strike, the aircraft fuelling system was unavailable for a period this morning. Engineers have been on site and have now restored the system, however flights may still be subject to diversion, delay or cancellation. It apologised for the inconvenience and is advising all passengers to check with their airlines for their latest flight updates. Email “Passengers left stranded at Stansted Airport over lightning strikes”. Feedback on “Passengers left stranded at Stansted Airport over lightning strikes”.